Here is something new (for this site) for the New Year: Outside Sudoku. This puzzle is also shown today on the Daily Sudoku variants page, but I thought I should properly introduce it. The rules: 1. 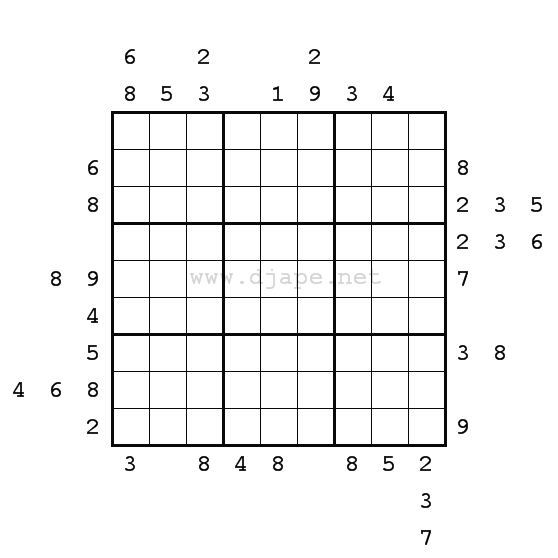 For the 9×9 grid all standard Sudoku rules apply. However, you don’t have any starting clues in there! 2. The clues are given outside the grid. 0, 1, 2 or 3 numbers are shown. 3. These clues tell you which numbers appear in the 3 closest cells in the grid, IN ANY ORDER (not necessarily in the order they are given in). In other words, the clues for a row tell you which numbers appear in the corresponding row and the closest nonet (3×3 box). Same for columns. I hope you will like it. I might start including them on the Daily Sudoku page, of course in some variant version (the non-consecutive outside sudoku type looks particularly interesting). This entry was posted in Free sample puzzles, General, Sudoku Variants and tagged CONSECUTIVE, Daily Sudoku, Daily Sudoku Variants, New Year, ORDER, Outside Sudoku, rules, standard sudoku, Sudoku Variant, Sudoku Variants, variant. Bookmark the permalink. Post a comment or leave a trackback: Trackback URL. Something new, I do like it! Cool! Took me about 1/2 hour or so to solve this morning. I’ve always liked non-consecutive puzzles in general, so an outside non-consecutive would be nifty. I love outside sudoku – please have MORE!!!!! And you’ve pronounced some new books on amazon for the next months! Really urgent for me, cause I need new stuff !!! The green covered outside sudoku….. The problem is I have done it 5 times now. Cannot find another book like it. Is there any chance you will be doing another on only I am begining to remember certain grids. Good news for you! 🙂 There already is a book with Outside Sudoku puzzles: Flower Sudoku and Outside Sudoku.